As "Slavic" one defines countries speaking a Slavic language - Russia, Ukraine, Belarus, Poland, Czech Republic, Slovakia, Bulgaria, Slovenia, Croatia, Serbia, Bosnia and Herzegovina, Macedonia and Montenegro. Eastern Europe also comprises the Caucasian countries Georgia, Armenia and parts of Azerbaijan. Hungary, Romania, Moldavian, Lithuania, Latvia and Estonia ethnically do not belong to Eastern Europe, but sometimes are ascribed to it. The Slavic and Eastern Europe markets concerning the show laser branche are different depending on the country. Laserworld and its partner Emotion Media Factory did some splendid lasershows and installations there. An extraordinary project of superlatives surely is one of the largest floating fountain multimedia systems in Europe in Vinnytsa in the Ucraine. After nine months of planning and construction the attraction opened in September 2011. A huge water screen with thousands of nozzles toghether with fascinating water fountains were built up - a tremendous projection screen for laser light shows and video projections. 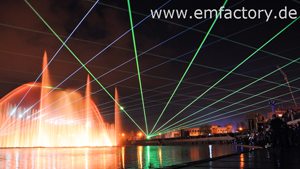 Special laser and multimedia shows with show laser systems of Laserworld were designed for the performances, that take place during the summer months on the weekends and draw thousands of spectators. 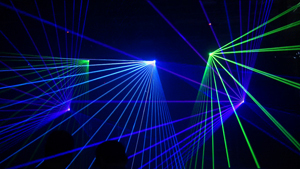 Also well known clubs in Bulgaria are equipped with our showlasers. Moscow also has got an international music exhibition - the Music Moscow. Laserworld exhibited there in 2011 and 2012. In 2012 the UEFA Euro took place in the Ukraine and Poland - an amazing event not only for soccer fans. The opening and closing ceremony would have been an ideal occasion for show laser lights. They could have been integrated perfectly into the show as laser lights catch the spectators and give them the feeling to be a part of the whole show. The huge stadia would be a gigantic venue for such a show. The same applies for the IAAF athletics world championship in Moscow from 10. - 18. August 2013. Also parardes like the St. Patrick's Day Parade in Moscow as symbol of the Russian-Irish friendship on March, 17. are often accompanied by laser lights. 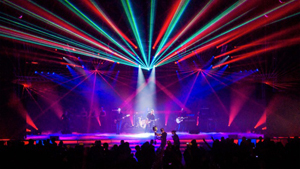 All this kind of events can perfectly be accompaigned by lasershow or other laser display applications. If you plan a laser or multimedia show in one of these countries, please contact [email protected]. We offer laser rental as well as complete laser show implementation and realization toghether with our longstanding partners.